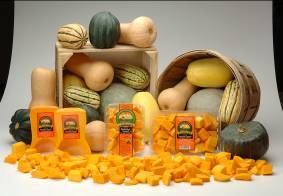 Martin’s peeled and cut butternut squash lets customers enjoy the taste, flavor and texture of fresh squash without the labor. We offer a variety of sizes and packaging styles, so we can help find one that’s right for you. · Much of the equipment used at Martin Farms was designed or modified on site. · We have designed new packages and labels for retail customers. · We package up to 40,000 pounds per week for our retail buyers. Workers place strips of peeled butternut squash on the segmenter to be cubed and then packaged. 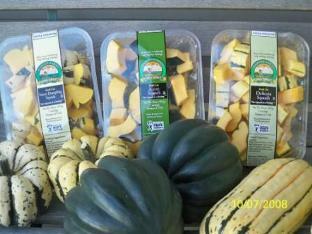 These fresh cut varieties have the same great home-style cut as our famous butternut squash.